The fifth and final day of the MGE2 began with the European Union setting the topic to the ITI and the PoA. The EU suggested that new technologies should be utilized in order to strengthen the ITI, and offered support to developing countries with its implementation. Mexico also stressed the need for the full implementation of the PoA, and also called on states to cooperate together to end SALW smuggling between neighboring countries. Russia also spoke extensively about the PoA and its dire need to be fully implemented on the global and regional level. They proposed several ideas to control the SALW trade such as banning the transfer of SALW without approval from both the sending and receiving state. Another idea was to ensure that SALW can’t be manufactured without a license. The Syrian Arab Republic briefly changed the subject to the war within its country. They spoke of how many large arms shipments have been sent to Syria from neighboring countries without the Syrian governments approval. There still is no written language in any agreement so far that condemns the sending of weapons to terrorists groups, and there is often no way to track weapons shipments into the country. CARICOM spoke next on the related issue of the transfer of ammunition, which is not included in the ITI. The Chair agreed that ammunition is something that still needs to be discussed at later time, because SALW cannot be used without ammunition. Brazil described their experience with ammunition controls by saying how they require all police ammunition to be marked. They also added that states must be patient when enacting SALW laws because results take time. Sweden offered some very constructive opinions and ideas. They emphasized that the SALWs are not the problem; rather the problems arise when SALW get into the wrong hands. Sweden called for strict tracking mechanisms using the latest technologies on newly manufactured SALW, and the need for a global cleanup of illicit arms. China also added to this suggestion that there needs to be control at the origin of the SALW manufacturing as well the utilization of the latest tracing technologies. Nigeria also spoke of their problems tracing SALW and ammunition. The Chair reminded them of existing framework that they should utilize. 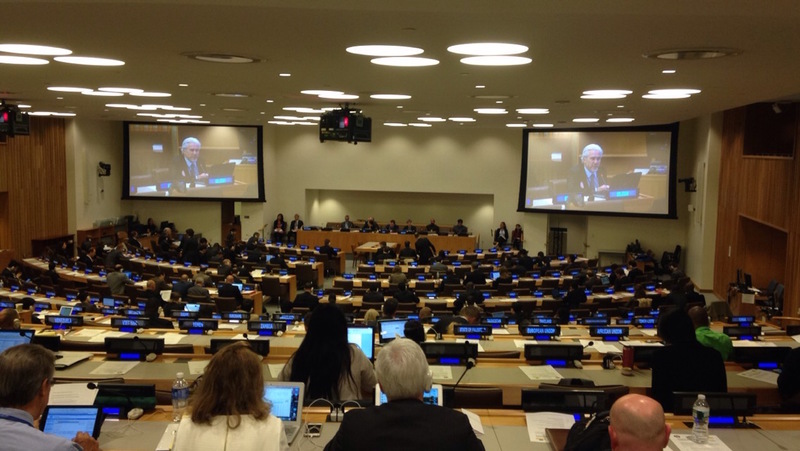 Switzerland offered its input on stockpile management and the lack of international action around this issue. Stockpile management will be discussed more at a meeting on the 16th and 17th of November 2015 in their country. Egypt then noted that ammunition management is outside the jurisdiction of the PoA and the ITI and it should be discussed outside of MGE2. Venezuela turned the conversation to the issue of how easily armed groups are able to acquire SALW, especially in the Middle East. There is the issue that weapons manufacturers are not doing anything to stop this. India added to this by calling for the use of the PoA to combat terrorism. Iraq continued on the topic to terrorism by calling on all states to make sure their political climate at home does not contribute to the growth of armed groups. The next six speakers from Spain, Belgium, New Zealand, Sweden, Guatemala, and Ghana, all spoke about the need to control SALW ammunition, which was the final topic of the MGE2. The MGE2 then concluded with the chair thanking all participating member states and civil society members for their contributions. The international SALW trade remains largely unregulated, and the regulations that are in place contain numerous loopholes. While SAWL trade regulations remain a work in progress, the MGE2 brought the world a step closer to regulating the weapons that have plagued the world for almost a century.